Blythe is a literary agent and marketer who secures books with publishers, conducts publicity campaigns and online marketing. She helps writers build the right book proposal, secures contracts, promotes books, and has placed authors in the national media. She has worked in publishing for more than 20 years and represents bestselling non-fiction authors and new voices. Blythe started in media as the Public Relations/News Director for WNAZ-FM in Nashville, Tennessee as a news reporter and host of two weekly radio programs. She became a publicist for Christian and country music artists and a writer for trade and consumer publications such as CBA, Christian Retailing, Focus on the Family publications, CCM Magazine, and others. She spent seven years working as Publicity Director and then Marketing Director at Thomas Nelson Publishers (now Harper Collins Christian Publishing) where she directed hundreds of publicity and marketing campaigns. In 2004 Blythe moved to Colorado and worked as the Product Development Manager for Ransomed Heart Ministries founded by New York Times bestselling authors John and Stasi Eldredge. She opened her agency in 2005, and is a member of CBA and AWSA. Blythe has a Bachelor of Arts degree in Mass Communication from Auburn University with a minor in Journalism. She lives in Colorado Springs with her husband, daughter, and boy/girl twins. Blythe actively works with the next generation ministry at their church and loves talking about God, exploring places and conversations with her family, and watching Auburn football games and Hallmark movies with Starbucks in hand. 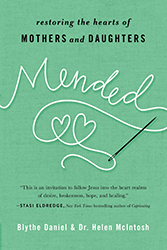 Blythe and her mother Helen McIntosh are the co-authors of Mended: Restoring the Hearts of Mothers and Daughters (Harvest House Publishers, 2019).